Crypto Creature – The Cornish Owlman! The Owlman, sometimes referred to as the Cornish Owlman, or The Owlman of Mawnan, is a purported cryptid that was supposedly sighted around mid 1976 in the village of Mawnan, Cornwall. The Owlman is sometimes compared to America’s Mothman in cryptozoological literature. 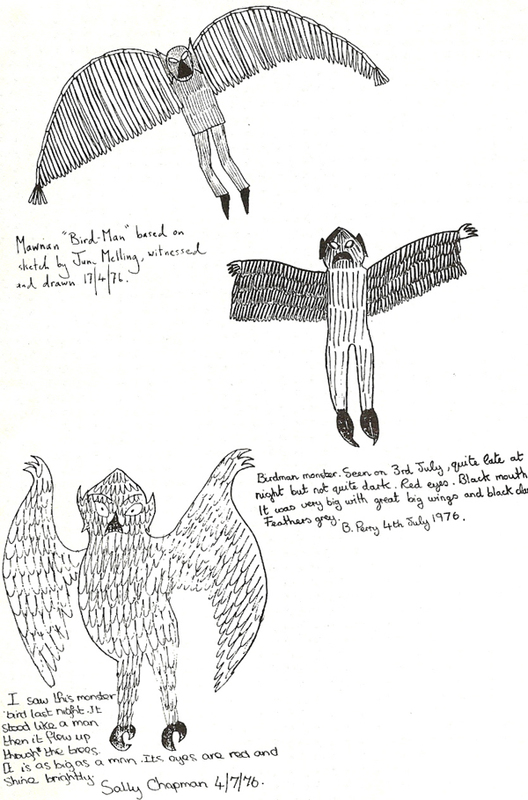 Doc Shiels’ version of a drawing of Owlman made by twelve year old June Melling. The church tower at Mawnan.The Owlman story began when paranormal researcher Tony “Doc” Shiels was approached by a man, Don Melling, who had been visiting the area on holiday from Lancaster. Melling said that on April 17, 1976, his two daughters, 12-year-old June and her 9-year-old sister, Vicky, were walking through the woods near Mawnan church when they saw a large winged creature hovering above the church tower. The girls were frightened and immediately ran to tell their father. According to Shiels, the family had become so perturbed by the sighting that they had abandoned their holiday three days early and that the father would not allow either of his daughters to be interviewed. Sheils was, however, provided with a drawing of the creature made by twelve year old June. In a later study of the case, Jonathan Downes claims that Shiels first described these events in “a letter”, although he does not say who Shiels was writing to. The story was subsequently related in a pamphlet entitled Morgawr: The Monster of Falmouth Bay by Anthony Mawnan-Peller, which circulated throughout Cornwall in 1976. Two months later, on July 3, 14-year-old Sally Chapman was camping with a friend, Barbara Perry, in woods near the church. According to her account, as she stood outside her tent, she heard a hissing sound and turned to see a figure that looked like an owl as big as a man, with pointed ears and red eyes. The girls reported that the creature flew up into the air, revealing black pincer-like claws. Sightings of this figure continued to be reported on the following day (when it was described as “silvery gray”) and on two occasions two years later, in June and August 1978, all within the vicinity of the church. Previous to their encounter, the girls had read the pamphlet that described the Owlman’s appearance to the Melling girls. They contacted Shiels, who encouraged them to draw images separately; he considered them similar enough to verify their story but different enough to rule out conspiracy. In 1995, a female tourist from Chicago wrote to the Western Morning News in Truro, claiming to have seen a “man-bird… with a ghastly face, a wide mouth, glowing eyes and pointed ears” as well as “clawed wings”. In Alien Animals (1985), British paranormal researchers Janet and Colin Bord pointed out that Mawnan church is built in the middle of a prehistoric earthwork. They suggested that the church may be built on a ley line (a straight line that passes through and links several ancient sites), and speculated that the appearance of the Owlman may be a manifestation of earth energy in this place. However in Modern Mysteries of the World (1989), they retracted this and stated that they believed that the sightings were probably of an escaped aviary bird rather than a paranormal phenomenon. A more straightforward explanation may be that the Owlman sightings were of an escaped eagle owl (Bubo bubo), a species that can grow more than two feet long, with a wingspan of nearly six feet. This is supported by a report by Karl Shuker of a late 1980s sighting of the Owlman. The witness described it as four feet high, with two large toes on the front of each foot. It ducked down and forwards before it took off. Shuker states that this “calls to mind a very large owl”. The structure of the feet is also consistent with an owl identity, as owls have an arrangement of the toes known as zygodactyly, in which two toes point forwards and two backwards. A colony of eagle owls exists in North Yorkshire, and the bird is reportedly capable of crossing the English Channel. The Owlman appears in The Secret Saturdays episode “The Owlman Feeds at Midnight”. The Owlman is depicted as the god of a cult formed of brainwashed villagers. In the Animal Planet show Lost Tapes, the Owlman was the subject of the “Death Raptor” episode. In the novel The Owl Killers by Karen Maitland, a superstitious village is governed and terrorised by a menacing, masked group of vigilantes called The Owl Masters, who are purported to have the power to summon the Owlman. I have nothing but utter fear for the Cornish Owlman, he has the soul of an owl, he is capable of anything.